1. Line a square pan (I used 8in x 8 in) with two pieces of parchment paper going opposite ways. 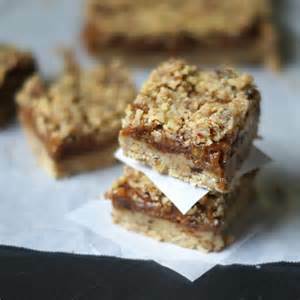 In a food processor, process the almonds, salt, and oats until a fine crumble forms. Now add in the dates and process until crumbly again. Melt the coconut oil and add to the mixture and process until sticky. You can add a tiny bit more oil if the dough is too dry. Remove from processor, set aside 3/4 cup of the mixture for later, and press the rest of the mixture very firmly and evenly into the pan. 2. Grab your pitted and roughly chopped dates, water and lemon juice and process in the food processor until a paste forms. You will have to stop and scrape down the sides of the bowl often. You can add a tiny bit more water if needed, but you want the paste quite thick. Scoop out the date mixture onto the crust and gently spread with the back of a wet spatula until even. 3. Sprinkle on the 3/4 cup of mixture you set aside and gently press down with fingers. Refrigerate until firm (approx. 1 hour). Cut into squares and serve. Store in the fridge or freezer.